“In the Original Text It Says:” Word-Study Fallacies and How to Avoid Them. By Benjamin Baxter. Gonzalez, Florida: Energion Publications, 2012, vi + 83 pp., $9.99 paper. 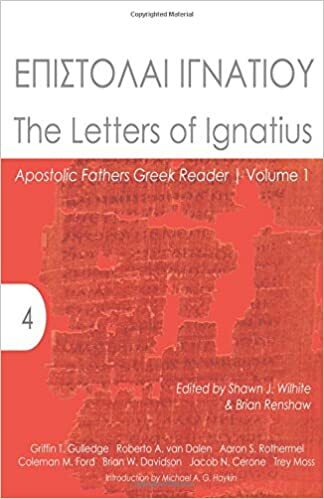 “In the Original Text It Says” is a brief introduction to word-study fallacies written “primarily for the pastor who is familiar with commentaries, who has at some point in time taken at least one introductory course in both Greek and Hebrew, and who is still able to sound out words in each language” (1). Baxter’s goal in this work is to provide his audience with the “ability to intelligently evaluate what we are told about the meaning of biblical words” (1). In order to accomplish this task, Baxter has divided his book into two main parts. Part A, entitled “Oh the Words We Meet,” is composed of two sections: five basic concepts about “word-meaning,” and a list of six word-study fallacies. Part B, entitled “Commentaries on Word-Meaning,” walks the reader through one Old Testament passage (2 Chronicles 1) and one New Testament passage (1 Timothy 6) applying the knowledge acquired from Part A. The first section of Part A, “A Few Words on Words,” contains five sub-sections necessary for comprehending the ensuing discussion. Each of these sub-sections contains illustrations unique to the English, Hebrew and Greek languages. This structuring enables the reader to move from the familiar aspects of his own language to the unfamiliar elements in the languages of his study. 1. Baxter makes the reader aware that words have a semantic range, or “range of meaning” (3). In English, bank can have some of the following meanings: a monetary institution, a blood bank, a snow bank, a bank of lights, or to bank a basketball off a backboard. Similarly, כסע, depending on the context, can mean either chair or throne; ξενίζω, likewise, can mean to lodge or to be surprised. 2. Within any language, the semantic range of one word may overlap with the semantic range of another. This phenomenon is known as synonymy. Some examples provided by Baxter are as follows: angry and mad, smile and grin, λόγος and ῥήματα, ברא and עשה. Baxter is careful to inform his reader “it is unlikely that any language has absolute synonyms” (5). That is to say, no word shares perfect overlap of semantic ranges. 3. If a word has a semantic range, how can the reader be expected to determine meaning? Baxter writes, “A word’s meaning is controlled by its context.” I often receive distressed sighs from my Hebrew Grammar students. You can see the wheels turning in their brains, “If ל + the infinitive construct can complete the thought of the verb, express purpose, or further explain the nature of the verb (epexegesis), how will we ever determine its meaning?” My response, “context, context, context.” Baxter writes, “It is through the examination of the context in which a word occurs that its meaning is determined” (8). 4. Next, Baxter informs his reader that words are plastic. That is, words are capable of changing meaning over time in order to adapt to new usage. Baxter offers nice as an example. Nice comes from the Latin nescius, which means ignorant. At one point in Middle English the word was used with the nuance “stupid.” For this reason, “the time-period in which a piece of literature was written is part of the context that controls word-meaning” (12). 5. The final concept explored by Baxter involves the differentiation between meaning and translation. In translation the translator seeks to determine the meaning of a word within its context and find an appropriate word to represent it in the target language. Just as Greek and Hebrew words have a semantic range, so also do English words. It is highly unlikely that the semantic range of one Greek or Hebrew word will overlap in every instance the semantic range of an English word (perfect synonymy). Therefore, it cannot be said that one English word is capable of representing the entire semantic range of one Hebrew or Greek word. The reverse is also true; the entire semantic range of one English word cannot be said to represent the Greek or Hebrew word it translates. The second section of Part A, “Word-Study Fallacies,” contains six sub-sections. Much like the first section of Part A, Baxter provides his reader with an example unique to English, Hebrew, and Greek. 1. “All Meanings Lead to Rome” is the first fallacy Baxter explores. This fallacy contains two basic elements. First, the root of a word does not necessarily provide the “basic meaning” of that word. For instance, awful is composed of two roots, awe and full. Simply because awe is used to denote an element of surprise or wonder does not mean that awful describes something full of wonder (15). Second, the semantic range of an English word used in translation cannot be indiscriminately imposed upon the Hebrew or Greek original. While, holy can connote “healthy, sound, whole” it does not follow that God’s command “be holy for I am holy” (Lev 11:44-45) has anything to do with healthy living (15). 2. The second fallacy Baxter addresses is “Time Warp.” Time warp happens either when a relatively modern definition for a word is used to translate an older term (semantic anachronism), or when an archaic definition for a term is used to translate the word in question (semantic obsolescence). 3. The “Swamp Water” fallacy happens when one takes “a word in a particular context to say far more than it actually does, filling it with multiple meanings or information that is actually found apart from the word itself” (18). Baxter proposes three variations of the “Swamp Water” fallacy. First, one attributes the entire context wherein a word is used as that word’s “actual” meaning. Second, “information gleaned from a number of different contexts in which the same word is used is collectively said to be the meaning of the word” (19). Finally, multiple English glosses for a word are gathered together and found to be relevant in defining a particular word. 4. “Lost in Translation” relies heavily on concept five in the previous section, the differentiation of meaning and translation. In this fallacy the translator assumes that the semantic range of a particular word is equivalent to the semantic range of a word in the target language. Baxter rightly observes that students of the Septuagint are particularly prone to this pitfall. Too often it is assumed that the Greek translation of an unknown Hebrew word in the LXX is equivalent to the original Hebrew word. 5. Understanding principle two, synonymy, informs fallacy number five, “A Sea of Synonyms.” Synonyms are not equivalents, but they share overlap in certain contexts. This fallacy has important implications for parallelism in Hebrew poetry. Though Baxter concedes that there are in instances where synonymous terms in a parallel construction has little to no development, he also notes that development is, more often than not, expressed even when synonymous terms are utilized (28). 6. Baxter’s final word-study fallacy is entitled “Contextual Amnesia.” This fallacy exposes the tendencies for translators to translate a word in the same way throughout the entirety of a specific work. This tendency assumes that the author either a) is only allowed to use a word in one manner, or b) is oblivious to the semantic range of the word he uses. Baxter cites the following as a rather humorous English example; “You can bank on his car sliding into the snow bank on his way to the bank” (31). It would be absurd to treat the word “bank” in this sentence as only denoting a financial institution where money is stored. The second section, “Part B: Commentaries on Word-Meaning,” puts into practice everything learned in Part A. Baxter analyses three commentaries: Cornerstone Biblical Commentary, Expositor’s Bible Commentary, and the NIV Application Commentary. He has selected volumes within these series because they are explicitly aimed towards pastors (33). Baxter systematically cites each commentary regarding the passage under consideration. Areas of strength, weakness, caution, and concern are all identified as Baxter seeks to train his reader to skillfully assess the resources he utilizes. Baxter is to be commended for this short treatise on word-study fallacies. His ability to systematically organize his book has made the book accessible for all readers. Baxter knows his audience and refuses to leave them behind. Multiple examples unique to English, Hebrew, and Greek are provided in each part, section, and sub-section of the book. When lengthy passages are cited as an example of the concept under discussion, Baxter does not allow the book to be laden with cumbersome blocks of un-translated text. Instead, he only includes the original text when a specific word or phrase is under discussion, and even then he provides a translation for that word or phrase. It may seem to some that Baxter’s book is unnecessary when compared to D. A. Carson’s formative work, Exegetical Fallacies. While Caron’s text is a must read for all scholars, seminary students, and pastors, Baxter’s work retains its value. Readers of Exegetical Fallacies can easily become bogged down in its terminology (semantic anachronism, semantic obsolescence, illegitimate totality transfer, and verbal parallelomania), as well as his in-depth criticisms. Furthermore, Baxter gently leads the reader through major commentaries teaching him how to apply his newfound knowledge. In essence, Baxter has succeeded in moving the cookie jar down to a lower shelf. Baxter’s greatest strength, making the information in Exegetical Fallacies more accessible, turns out to be his greatest weakness. As I progressed through Part B, Baxter would quote a commentator and critique him for engaging in the “Swamp Water” fallacy. At times I was left wondering which of the three aspects of “Swamp Water” the commentator has offended. Baxter leaves us without hooks on which to hang all the nuances his fallacies. “In the Original Text It Says,” at points, left me outright confused. In Baxter’s section on the “Time Warp” fallacy (a combination of Carson’s categories semantic anachronism and semantic obsolescence), he writes, “Similarly, should we believe that a ‘butterfly’ is churned cream that has grown wings?” (16). I do not know of time in the English language when “butterfly” has ever meant, “churned cream that has grown wings.” I would have expected to find this example in the previous word-study fallacy “All Roads Lead to Rome” under the subcategory of root fallacy. Aside from these minor criticisms, it is my belief that Baxter’s book should be read, not only by pastors, but by anyone who holds a teaching position in the church. If teachers seek answers from their commentaries, it is essential that they know how to appropriately evaluate the content they find therein. I have been looking for a text accessible to my small group of dedicated Hebrew Grammar students; the search is over! This entry was posted in Book Reviews and tagged In the Original Text It Says. Bookmark the permalink. Thanks for your review. Very thorough and informative.